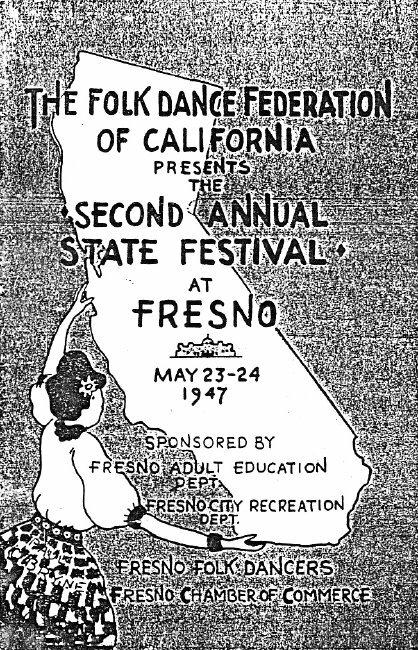 The 2nd Annual Statewide Festival was held May 23rd and 24th, In Fresno, with Thelma Denning as Chairperson. Saturday morning there was a joint meeting of members from the North and South, chaired by Lucile Czarnowski. Plans were made to coordinate such things as dance patterns, music, and to work closely with each other on many things. Those who had arrived early were invited to attend an Opening Party at the Shacks Friday evening. Saturday afernoon there was dancing in Roeding Park, hosted by President Walter Grothe of the North and President Allen Pelton of the South. The dancing was followed by an outdoor supper. The main festival was held in Memorial Auditorium Saturday with dancing, exhibitions, and an "Old Country Food Market" in the foyer. Here, favorite dishes of Fresno's many nationality groups was put on display and it was well patronized. The program featured mostly couple dances with just one set of squares called by Danny McDonald and Ed Kremers. An Evaluation Meeting was held Sunday morning in the California Hotel. It was generally agreed that many of the problems of the first festival had been overcome but there was still work to be done. A vote of thanks was given to Thelma Denning and her Committee for a fine festival. 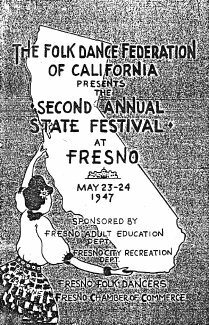 In fact, everyone had such a good time there was little or no objection to granting Fresno the festival for the following year, 1948. I looked forward to this next festival with great fervor as did everyone in attendance. The attendance at the 1947 Festival so far exceeded expectations that the supply of problems ran out early. It was the one program missing in my collection but Elsa Miller (of the South) came to my rescue, sending me one several years later for which I am very grateful as my collection is now complete.